Oh my goodness, Kitty, 100 degrees is very hot. The perfect weather for yummy homemade ice cream. 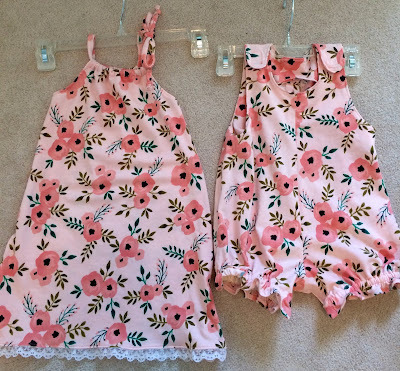 Your grand daughters' matching outfits you stitched are so sweet. Love the fabric. Hooray for ice cream...sounds very refreshing! 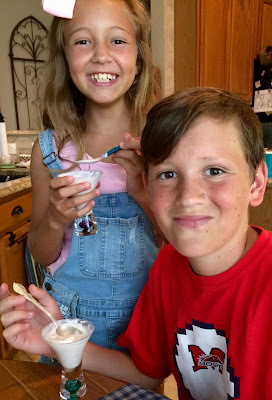 The not-so-littles look very happy with the choice of ice cream and the beautiful goblets to eat it from. The grandgirlies look adorable in their matching outfits! What a delightful post!Adorable Grands and a cheerful table!That ice cream looks yummy!Hugs,dear Kitty! Having homemade ice cream is the perfect way to cool off. I love the pretty plant in that planter too. The matching outfits you sewed are just so cute. You have such wonderful grandchildren!! YUM! I've also been eating lots of ice cream to stay cool in this heat. May I ask what type of ice cream maker you have? Is it easy to use and clean? So much cuteness Kitty! Boy, brother and sister really look a like, so cute those ice cream smiles! 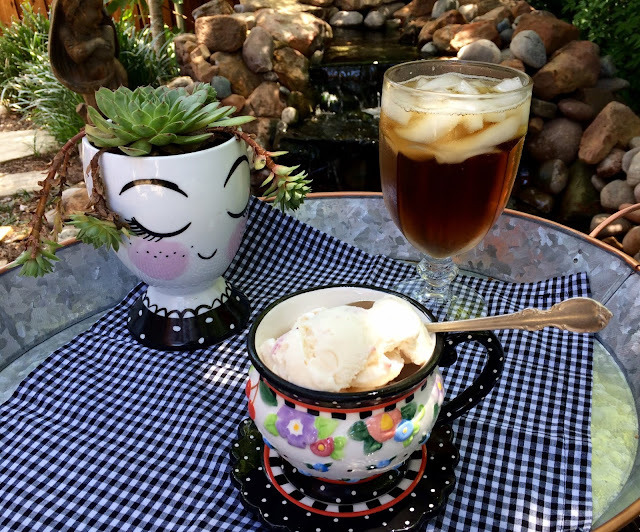 The plant looks adorable in your sweet cup and the ice cream sounds wonderful! All those kids look so cute! Love the fabric and what you made, Kitty. The ice cream....is that the Cuisinart ice cream maker you used? Are you saying it can done without an ice cream maker? I'm pinning this, thank you! Oh how handsome kids you have dear friend ! I need to get an Ice cream maker, the last one I gave it away. I'm already loving your recipe. That cute cup with the plant it's just adorable ! I can't believe the temperatures forecast for you this week. Hope they are wrong! Your table is styled so cute! Your succulent container is adorable as is your cup and saucer. That ice cream looks delicious. I have the same maker and I should get it out and use it. I am so impressed with your sewing. 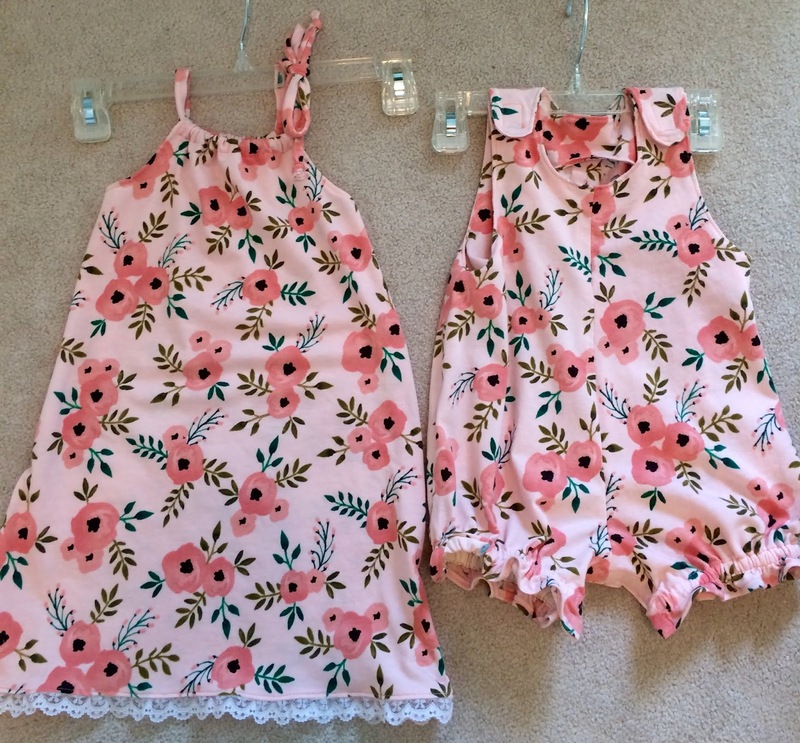 Darling outfits for the little girls! Hi Kitty, I love the pretty blue checks as the background to your whimsical pieces, just adorable. 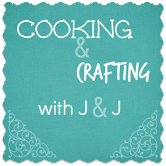 Cute outfits for the girls and yes, I know they all bring you so much joy :) Thanks for the recipe, it is a lot like one I use, just a tad difference. I want to try yours so I've already printed it. It's so hot and humid here too Kitty. Best staying inside during the day. Doing watering early morning. Oh YUM! I haven't had homemade ice cream for the longest time and want some now! I don't have an ice cream freezer but I have seen a recipe that you can even make some in a plastic baggie! 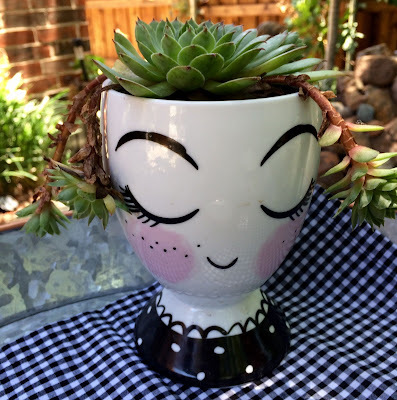 Your hens and chicks are just perfect in that adorable lady vase...and such adorable little outfits! Blessings! Oh, how I miss the days of freshly churned ice cream! I was just talking about it the other day with a friend. 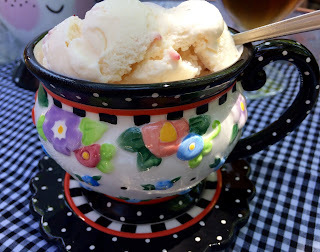 I reminisced about how my Mom wouldn't let us drink coffee, but we could eat all the coffee ice cream we wanted! (Times sure have changed. I see little kids in coffee shops ordering up lavish coffee drinks by the gallon!) I'm trying VERY hard to lose weight right now, otherwise I'm sure I'd run right down to Walmart and buy an ice cream machine! I'll enjoy it vicariously through you and the grandkids for now. :-) CUTE outfits with CUTE fabric!!! Your daughter-in-law scored big!!! Oh, wow, the ice cream looks delicious, and those little ones are just adorable. I haven't seen the hen and chicks plant in years. My, that took me back to a long time ago as a girl growing up in Ohio. So sweet of your sister to send a little piece of OH home with you! Sending love and hugs to you, sweet friend, and praying for you. I love ice cream! What a fun summer you're having. Such cute matching outfits! From the big smiles, you can tell that the ice cream was a hit. 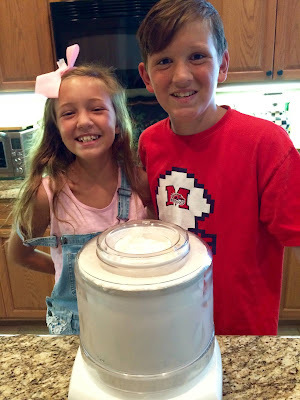 The ice cream sounds wonderful and your grandchildren look happy making it. The outfits are adorable. I love when chilfren dress the same.. and that Mary engelbreit teacup I just love it.. so nice to visit, with love Janice . Oh my Kitty - what darling outfits for the kiddos. Those are so sweet. I think your plant is darling. I know they all loved your ice cream and this certainly is the hottest summer! Thanks for sharing. The outfits are too cute! I love homemade ice-cream. Yum! Happy Summer. Stay cool. I can't wait to make this ice cream...sounds so so good. Your grands are all so cute, Kitty...and I know first hand how they are so good for your heart. We love them so. Kitty, love the cooking campers and their latest treat. 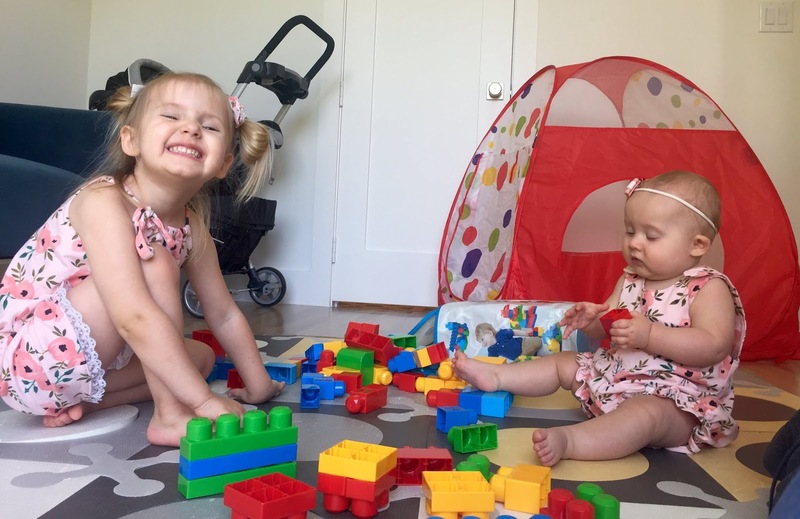 AND the littlest granddaughters in their matching outfits. You're such a good grandmother! Yes, it's a good month for ice cream! Hot here as well Kitty. Love fresh fruit in anything, and the little outfits are so sweet! Thanks for sharing with SYC.